The pine sawfly is a pest of Scots pine but can utilize other hosts including lodgepole pine. It is found throughout Europe and is considered one of the most serious defoliators of pine in Russia, Ukraine and Belarus. Wyoming has a moderate to high amount of pine material that could potentially host the pine sawfly. To date the pine sawfly has not been found in the United States. 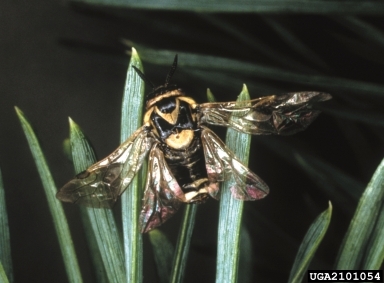 The pine sawfly survey by the USDA APHIS-PPQ began in 2013. A delta pheromone trap is placed on or near the host tree. If suspects are found, they are sent to the Oregon Department of Agriculture for further identification. Thirty-seven traps were placed in seventeen Wyoming counties. All suspects examined were negative.